Most people talk about “Usenet accounts” without distinguishing between the 5 different types of accounts that exist for accessing newsgroups. Learn about the different types of Usenet accounts. 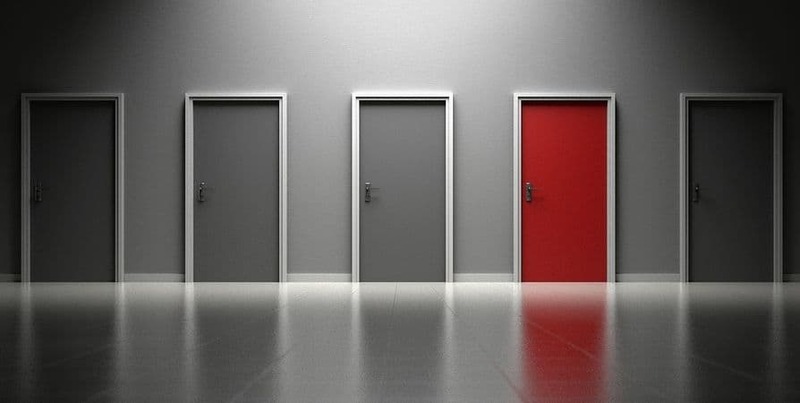 When you’re deciding on a Usenet provider, you’ll obviously want to consider price, features, and the like. But you’ll also have to figure out what kind of Usenet account you actually need, since different users have different needs. We’ve highlighted the various types of Usenet accounts below. While some Usenet veterans prefer to download all headers with a newsreader and sort through them on their end, a lot of folks don’t have that kind of time – or bandwidth. These accounts let you dig through the available files and even preview them, so that you can download only the specific files you want. These providers will also join multi-part files together automatically, so you don’t have to deal with it. A web-based Usenet account like Easynews makes downloading from newsgroups a visual experience. Many Usenet providers, particularly those in Europe, place speed limits on their unlimited data plans. You can download as much as you want, but only at, say, 6 Mbps. For a slightly higher price, you can usually get an account that gives you unlimited data and unlimited speeds, though this isn’t an option with all providers. These completely unlimited plans are the best option for veteran Usenet users with plenty of bandwidth at their disposal. While providers do advertise the data as “unlimited”, some have been known to throttle speeds if you go really crazy. But this isn’t something you need to worry about unless you’re pulling down terabytes of data per month. An unlimited access account is a no-brainer if you plan on doing a lot of downloading – but they also tend to provide the best value, which can make them a good choice even if you’re not grabbing gigabytes upon gigabytes of data each month. 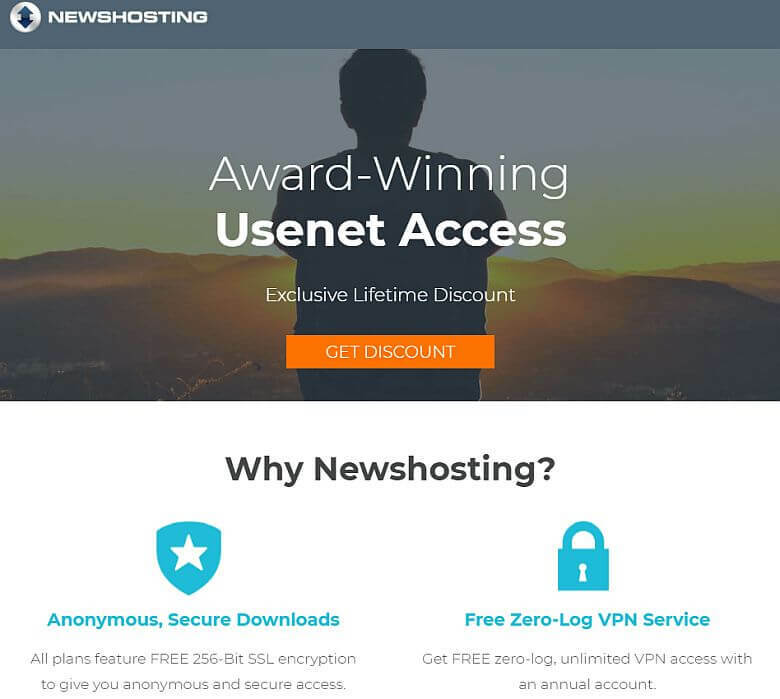 Newshosting is the best overall unlimited Usenet account. 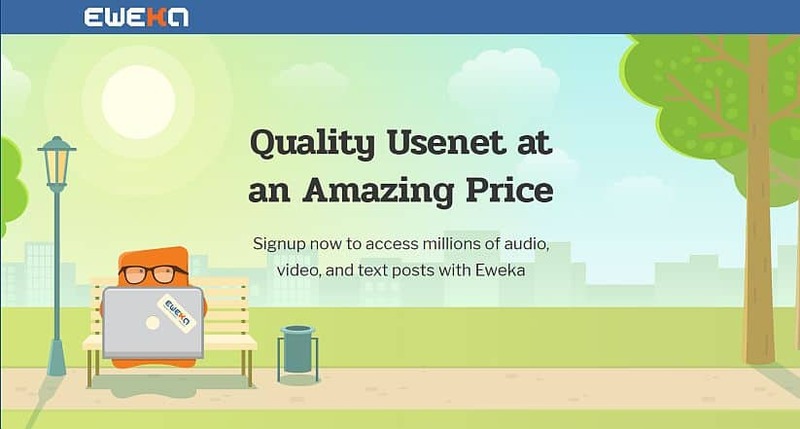 Eweka is the best unlimited Usenet account for European customers. If you’re a more moderate Usenet member, you might be interested in a metered account. These accounts allow you to download a set amount of data per month. For instance, 20 GBs. Once you hit that limit, you’ll either must wait until the next month to start downloading again – or refill your account. Metered accounts are not the same thing as block accounts, which we’ll cover below. Most providers don’t let you carry over unused data from one month to another. For example, if you only use 5 GBs of your 20 GBs allowance in January, the extra 15 GBs will be lost – and you’ll start over with 20 GBs in February. But some providers do let you “rollover” data, provided you remain a subscriber. Metered accounts tend to provide the least value of the main account types, and we only recommend them for users with very specific needs. 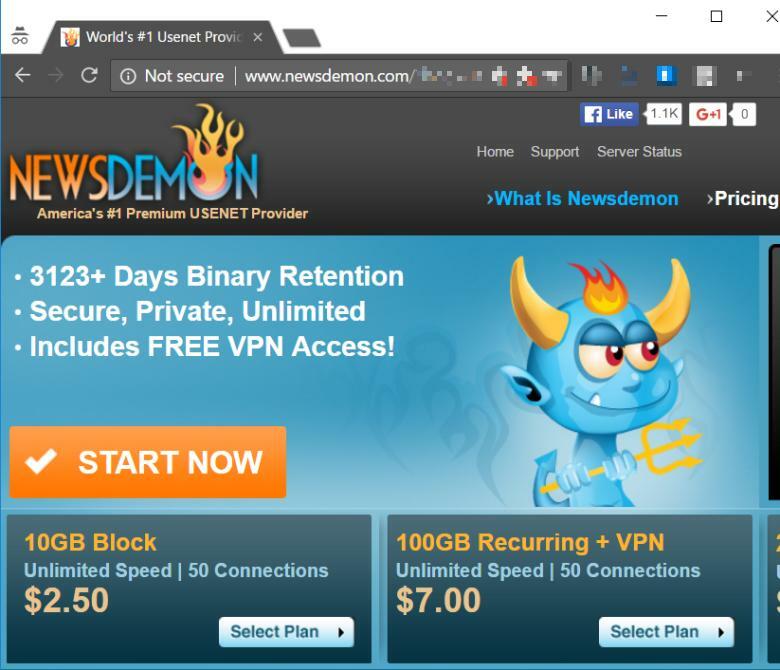 NewsDemon offers metered Usenet accounts. Block accounts also give you a specific data allowance, but they differ from metered accounts in that they aren’t limited to a single month. For instance, if you buy a 100 GB block account with a 12-month period, you could use 6 GBs in January, 12 GBs in March, and 82 GBs in August, but you’d only pay once, when you initially signed up for the account. While block accounts are not limited to a single month, they typically have a 3, 6, or 12-month usage period, depending on the amount of data and provider. Block accounts are great for folks who only download from Usenet occasionally and don’t need a monthly plan. But they also make an excellent backup provider too. Many veteran users will pair an unlimited account from one provider with a block account from another provider on a different backbone, since this gives them access to the greatest number of binaries. Usenet.Farm is a sleek and impressive Usenet block account provider. For users that need Usenet and a VPN, bundle packages can be a great deal. Considering that a good VPN usually costs anywhere from $2 to $12 per month, if you can get one included for free in your monthly Usenet plan, that’s a solid value. However, there a few things to keep in mind. The VPNs included in these bundles are usually not among the top-rated VPNs on the market. 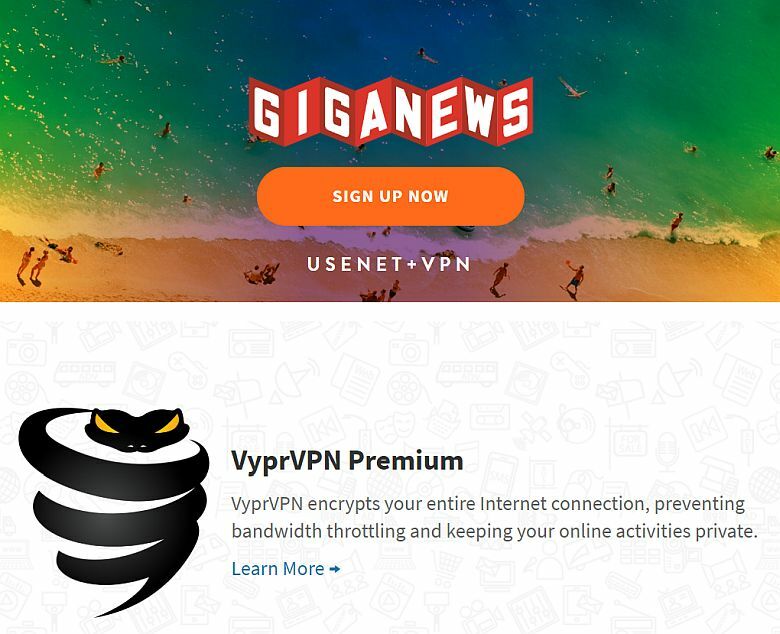 The big exception is the Giganews + VyprVPN deal, since VyprVPN is one of the best VPNs you can buy today (see our full VyprVPN review). So, if you’re a Usenet newbie who just wants a VPN to use with newsgroups, these bundles are good. But users seeking a top-of-the-line VPN will typically be better served by buying it separately. You can read more about our most recommended VPN services. Unlike torrenting, you don’t NEED a VPN to download from Usenet. Sure, it’s always a good idea, but you can still use newsgroups safely and privately without one provided your Usenet provider uses SSL connections (and most do). The Giganews + VyprVPN bundled Usenet account is hard to beat for quality. Most people are best served getting an unlimited monthly Usenet account. However, the other four account types will appeal to some. Block accounts are ideal as a backup Usenet provider for achieving the highest download completions possible. Part-time downloaders may be attracted to less expensive but metered accounts while those interested only in images and videos might lean towards a thumbnail/browser-based Usenet account. Lastly, newbies may want to kill two birds with one stone and get a decent Usenet-VPN bundle account.